This is a scheduled post so I hope Mr Blogger is behaving himself. 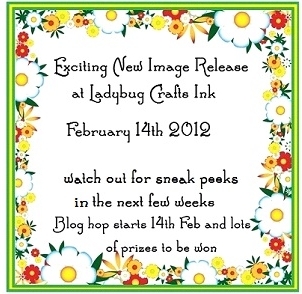 There is a lot of excitement amongst the Design Team at Ladybug Crafts Ink at the moment as there is a new release on 14th February along with a blog hop!!! So all of us Ladybugs have only seen the image that head Ladybug Kerry sent us, although I think some have tried to get their hands on the whole set.heheheeee... So its going to be a great surprise for us all when the cards and images are revealed next Tuesday. How exciting! I ended up making two cards with my image so here are my sneaky peeks........ I think you are going to Love it....such a versatile image too. Hope to see you next week on the hop! Oooooh, can't wait to see them in their glory honey! Thats a very sneaky peek Sally, need to see the rest now! !